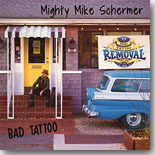 This month's Pick Hit is awarded to the latest disc, Bad Tattoo, from northern California guitarist Mighty Mike Schermer. As with his previous albums, this one's a whole lot of fun. Paul Oscher doesn't record frequently enough, making his latest disc, Cool Cat, an easy pick for as our Surprise CD this month. This month's Flashback feature reviews the new book about the history of Alligator Records, Bitten By The Blues, written by label founder Bruce Iglauer with help from Patrick A. Roberts. Our What's New section features new CDs from Ally Venable, Rick Vito, Johnny & Jaalene, Tommy Castro and the Painkillers, Rockin' Johnny & Quique Gomez, Tony Holiday, The Seamus McGarvey Band, Sean Chambers, Eric Bibb, Popa Chubby, Big Al and the Heavyweights, David Lumsden, Anthony Gomes, Bryan Lee, In Layman Terms, Ruth Wyand, and more.